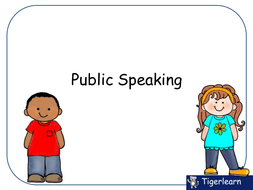 A short course designed to get primary students confident in their public speaking, specifically in reading stories they have written in another class. Pack includes a simple PPT identifying voice, body language, language, content and eye contact as the important features of public speaking. Students use this to fill in the blank rubric (included) in the first class. From then on, students come to the class with a piece to perform and Prepare, perform and do a group reflection based on their notes and rubrics.